CUMBERLAND — Three office relocations, six county administrators and 10 boards of Allegany County commissioners, Carol Gaffney has outlasted them all. On Thursday, Commissioners Jim Stakem, Bob Hutcheson and Dale Lewis recognized Gaffney for more than 38 years as a county government employee, including more than 36 years in her current role as county clerk. Her last day of work is today, a day after the last of more than 2,500 public meetings for which Gaffney has recorded minutes. “It’s been my pleasure,” Gaffney said of nearly four decades of service. “It won’t really hit home for me until maybe the Monday after Christmas” when she returns from a trip to visit family in South Carolina. Gaffney said she made the decision to retire about a year ago. “Everybody said, ‘Oh, you’ll know’” when the time is right, Gaffney said. But after 35 years, then 36 years, she still felt obligated to begin work at 8 a.m. every weekday. So, out of the blue, she set the date for December of this year. The Allegany High School graduate and Cumberland native, who now resides in LaVale, said she never expected to spend the bulk of her professional career in one place. When she began as a secretary in March 1971 and was appointed 2 1/2 years later to her current position, Gaffney said some older workers at the time never figured she would last. “I guess I proved them wrong,” Gaffney said during an interview Thursday morning with the Times-News, about 75 minutes before her final public meeting. Gaffney said the public has helped her along the way. Shortly after being appointed clerk in September 1973, a man came in requesting to be paid for two fox heads he had obtained. “What was I supposed to do?” Gaffney asked of herself at the time. The county had a bounty on such items and, ultimately, made out a check for $25 to the man. Gaffney noted she began her job at a time before electronic typewriters were commonplace. Minutes from public meetings had to be typed on carbon copy paper. “Carol has been responsible for the official records of Allegany County Government,” reads a citation bestowed upon Gaffney by the commissioners. The job has changed extensively over the years, with certain duties evolving into new positions. Over 36 years, Gaffney has, at certain points along the way, also held the roles of personnel director, assessment appeals officer, indigent burials coordinator and public information officer, among others. 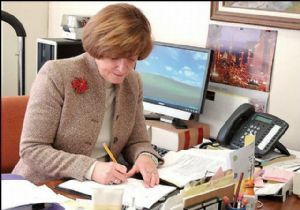 Lewis said Gaffney’s knowledge of county government is a true asset — as well as her approach to the role of county clerk. “She has no trouble saying to the county commissioners, ‘I don’t think that’s the correct way to do it,’ ” Lewis said. But Gaffney said her office served as a daily, direct reflection of the three commissioners. Officially, she had no opinion on any matter that crossed her desk since 1971. During retirement, Gaffney said she has every intention of staying involved. She’s willing to help in any way possible with the transition to a new county clerk. Additionally, Gaffney said she plans to volunteer at a local rescue squad and she wants to start a county employees retirement association. “I think it’s important (retirees) stay in touch with what’s going on in county government,” Gaffney said. Thursday’s meeting was adjourned in much the same way others are before Christmas, with each commissioner giving a farewell until the next public meeting.